Turn your pint-size package into a head-turning performer! 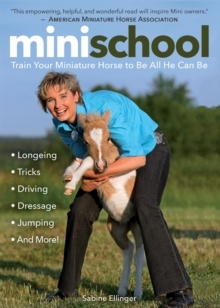 The first book of its kind for Mini lovers, Mini School takes the training and conditioning of Minis as seriously as that of their full-size cousins. With real, honest-to-goodness in-hand work that promises a relaxed, supple body and collected frame as well as obedience, you're given the tools to transform your cuddly companion into a sleek, well-muscled athlete and a talented entertainer.You'll find valuable information on: How Minis learn, with discussion of both "learning through association" and "learning through success," and ways to manage factors that impact your Mini's ability to absorb new lessons Work on the longe line, long lines, and long reins, with special instruction on the proper use of side-reins and whip cues Popular tricks loved by audiences and Minis alikebowing, kneeling, sitting, lying down, and rearing, to name a few Lateral work, including leg-yield, shoulder-in, haunches-in, and half-pass Dressage movements in-hand, such as pirouettes, piaffe, passage, and levade Conditioning through interval training and cross-training, featuring canter work, driving, cavalletti, and jumping gymnastics Plus a dictionary of voice commands and tips on how to use them. "